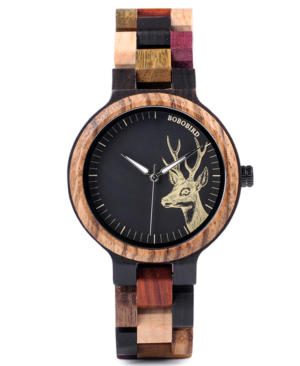 The face of this attractive ladies bamboo deer watch with leather strap plays homage to a beautiful creature – the deer. 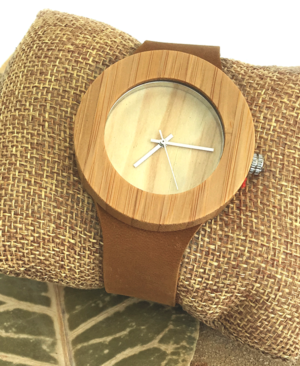 The bamboo casing is solid and chunky yet the watch is lightweight and comfortable to wear. A neutral coloured leather strap completes the theme of effortless style and practicality. 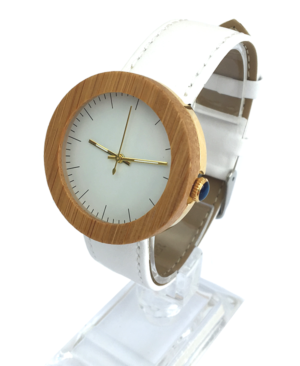 This Ladies Bamboo Patterned Face Watch with White Leather Strap is a fabulous new addition for 2018. The stylish look is similar to another of our popular ladies watches, however this example features a subtle pattern to the face. 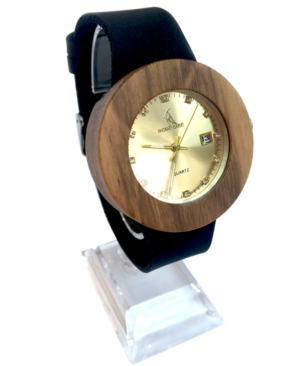 This lovely ladies bamboo watch with black leather strap is sleek and sophisticated! The chunky bamboo surround against the simplicity of the face with its stainless steel three-way movement is stunning. Teamed with a black leather strap to enhance the contemporary look, it’s a versatile and stylish addition to any outfit. 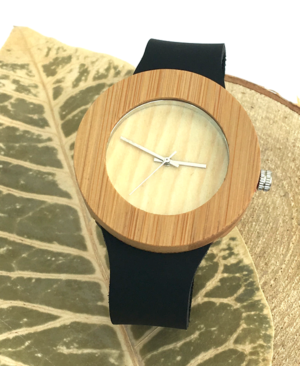 Fans of the natural look will love this bamboo ladies watch. From the simple bamboo face and chunky surround to the sleek contemporary styling of the face, its neutral tones and textures give it a wonderful natural dimension. The accompanying leather strap with its shades of caramel complete the stylish design. This watch is truly exquisite. We can’t help but admire the stunning design and skilled workmanship. There’s an elegant simplicity to the minimalist face whilst the combination of the wood, white leather and gold tones is incredibly striking. A gorgeous, chic timepiece that oozes style! 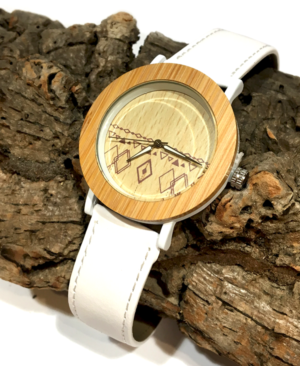 This ladies chunky bamboo Quartz watch with PU leather strap (new for 2018) is a real style statement! 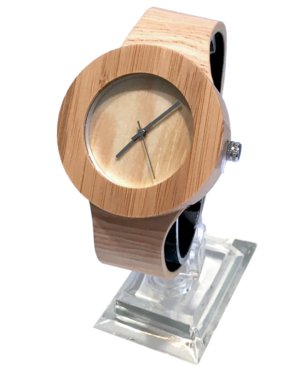 The chunky bamboo surround gives the watch a contemporary look, whilst the wood effect PU leather strap adds a stylish, natural dimension that perfectly complements the watch face and bamboo surround. 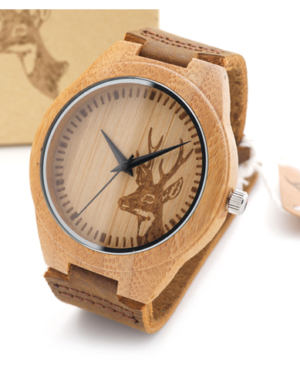 This Ladies Deer Design Wooden Watch is incredibly striking. The wooden bracelet style strap features a stunning array of colours produced from a combination of glorious woods including Zebrawood, Blackwood and Redwood. This ladies watch is a great addition to our Summer 2017 collection. 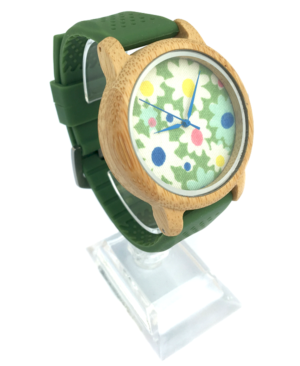 If ever a watch could be described as ‘cheerful’ then this is the one! 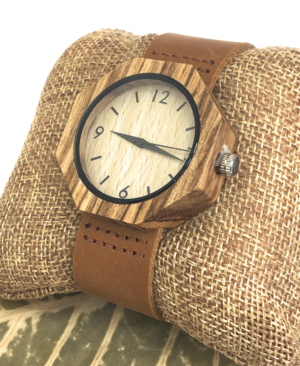 This ladies wooden Quartz watch oozes style! The chunky bamboo surround gives the watch a contemporary look, whilst the beautiful pale gold tones of the watch face and its sparkly embellishments brings a hint of glamour and sophistication. 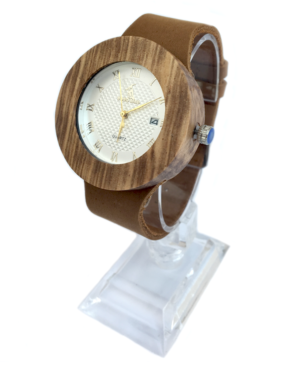 This Ladies Vintage Wooden Quartz Watch With Leather Strap is an all round favourite with the Crazy About Wood team. We think it’s because it combines the rustic charms of a chunky, wooden surround with the delicacy and sophistication of the beautiful white face with subtle gold markings. 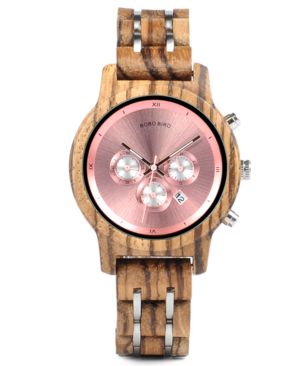 This Ladies Zebrawood Chronograph Luxury Watch is quite simply stunning! We adore the rustic charm of the zebrawood surround and bracelet, which sits in perfect contrast to the beautiful, feminine pink shade of the face. We think it’s a combination that’s inspired.